this is my 100th post, which is a bit of a deal to me. I don't write a day-in-the-life blog, where anything I do or think can be a post. When I put something on here (from drawings to written articles), it's usually something I've worked hard on, in my free time. I'm really glad that after starting a few years ago, I'm still at it. The month was a bit busy, but I managed to squeeze this in, in the nick of time. Also, I'm not numbering these art posts anymore, since I seem to do them more than anything now. Inspiration comes to us by way of Persona 3; the character below is Mitsuru Kirijo, class rep at a Japanese high school, and every stereotype that entails. I'm happy with this one. It's definitely the best line work I've ever done, though my name may deserve an asterisk the way Barry Bonds's does. See, I used an obscene amount of steady-stroke assist; very little of this is my own hand's strokes. It's a very welcome feature of SketchBook Pro, the software I use, but it does allow you to use crutches like that every now and then. I actually did demo Photoshop since my last drawing, but I found it too "big" for my current needs. This is one of the few times you can see me do an at-least halfway decent rough sketch before jumping into the fancy stuff. I've been watching tutorials on YouTube (mostly from Draw With Jazza), which have taught me a lot in terms of making stuff on command. Most of my drawings (the ones I would consider "good" anyway) could be half-attributed to luck in a lot of cases. This time, I really felt like I knew what I was doing. Whether that's imagined or not remains to be seen, but hey. I took special care to do each line in one stroke (or at least fix it really carefully). Once I'd done that, I made sure I made all of the proper erasures to ensure there was little or no "bleeding" or unintended color overlap. The result (in my opinion) came out really really sharp, and is essentially what I was hoping it would look like. I had some trouble working out the eyes into a shape I liked, but was eventually able to figure it out. If you watch the video, you can see me struggle with it for a while. 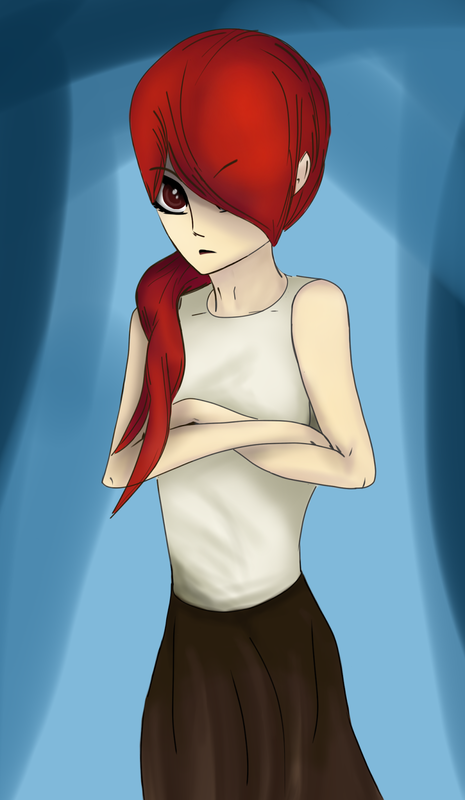 I had to pull up a picture of Mitsuru or two to make it happen. Thick eyelashes were surprisingly important to getting it right. The mouth also came out really well; I tried to do a more complicated shape but ultimately found less is more. So, yeah -- good times.